The Leyland PD3 with Northern Counties bodywork was a type most associated with Southdown Motor Services where they were known as Queen Mary's. 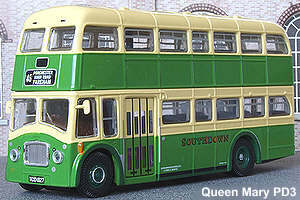 Southdown operated a sizeable fleet which became the operators standard double deck type during the 1950's and 1960's. Several batches were also purchased which could be converted to open top during the summer months for use on the operators coastal services. The OOC models comes in three main versions, early style with single headlamps, later style with twin headlamps, and an open top bus. 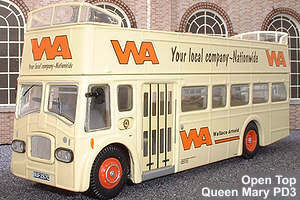 The model was introduced in late 1999 and a steady flow of releases has continued since, the majority of closed top models have featured Southdown buses but more operator variety can be found among the open top versions.